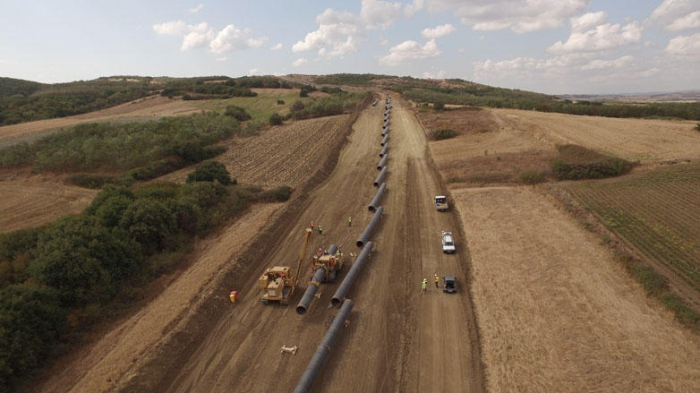 First ever offshore pipelines of the Trans Adriatic Pipeline (TAP) in Albania were successfully pulled ashore on March 30, Trend reports citing TAP AG consortium. The pipeline head reached kilometre point 0, where the offshore joins with the onshore section. “For this operation, TAP’s engineering, procurement, construction and installation (EPCI) contractor for the offshore section of the project, Saipem, used its pipelay barge Castoro 10. Steel pipes were welded together on board the vessel, which was located 1.4km from the beach. The welds were then tested and the pipeline was lowered onto the seabed. The first 1.8km of welded pipe was pulled ashore at the landfall near Fier,” reads the message. Saipem’s 139-meter long and 36-meter wide Castoro 10 pipelay barge now continues to lay pipes in Albanian shallow waters, to be followed by fibre optic cable installation and backfilling offshore and at the landfall, said TAP. TAP marked the start of construction works for the offshore pipeline section in October 2018. The pipes will be laid on the Adriatic seabed: 37 km in Albanian territorial waters,25 km in Italian territorial waters; and 43 km in international waters. The deepest point of the pipeline will be more than 810 metres beneath sea level. Approximately 9,000 pipes, with a 36-inch diameter, will be used, weighing approximately 100,000 tons in total.